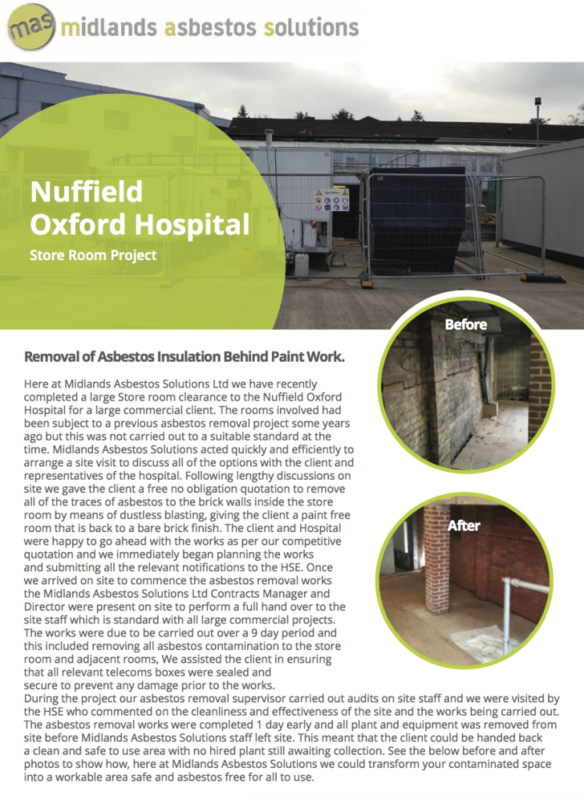 Midlands Asbestos Solutions Ltd recently completed a large store room clearance at Nuffield Oxford Hospital. The rooms involved had been subject to a previous asbestos removal project some years ago, but this was not carried out to a suitable standard at the time. Midlands Asbestos Solutions arranged a site visit to discuss all options for asbestos removal with the client and representatives of the hospital. Following discussions on site, we gave a free, no obligations quote, to remove all traces of asbestos from the brick walls inside the store room by means of dustless blasting. The end result would give Nuffield Hospital a paint free room, with a back to a bare brick finish. After further discussions, Nuffield Hospital were happy to go ahead with the asbestos removal works with planning and submitting of all the relevant notifications to the HSE being completed shortly after. Once on site our Contracts Manager and Director were present to perform a full hand over to the the Asbestos Removal Operatives to give them an understanding of the requirements of the asbestos removal works. The work was scheduled to take 9 day, which included removing all asbestos contamination in the store room and adjacent rooms. We also assisted the hospital ensure that all relevant telecoms boxes were sealed and secure to prevent damage prior to the works. During the project, the Asbestos Removal Supervisor carried out audits on site staff and welcomed a visited by the HSE, who commented on the cleanliness and effectiveness of the site and the work being carried out. The asbestos removal works were completed 1 day early. This meant all asbestos removal equipment could be removed from the site before Midlands Asbestos Solutions vacated the work area. As a result, Nuffield Hospital was handed back a clean and safe environment, ready to use as they required.